The items listed below are KentuckyRoads.com news items from January 2004. For the most recent updates see the KentuckyRoads.com home page. Gov. Fletcher told 300 attendees of a transportation conference in Frankfort that he believes a revised state tax code would help fund road projects. He also said that road construction in Kentucky should focus on economic development. Gov. Ernie Fletcher has allocated $113,600 from the transportation contingency fund for improvements to a stretch of US 431 where three people of have died in accidents since May 2003. Frankfort, Ky. - Using dollars from the transportation contingency fund, Governor Ernie Fletcher today provided $113,600 for some immediate improvements to a portion of US 431 south of Belton in Muhlenberg County known as �Dead Man�s Curve�. The stretch of road got its name from a recent rash of serious car crashes. Three people have been killed at the site since May of 2003. On January 8th, Governor Fletcher, along with Transportation Secretary Clay Bailey and legislators from the area met in the Governor�s Office with the Bobby Anderson family whose daughter was one of the crash victims. The Governor promised immediate action to improve safety on the roadway. State Highway Engineer Mac Yowell visited the site on January 13th and soon after dispatched a State road crew to remove trees and a portion of the hill on the west side of the curve to improve visibility. The state will also widen the shoulders and when the weather warms this spring, add a new skid resistant surface. Meantime, state engineers are developing a plan to completely redesign the dangerous curve. Federal funds are being used to pay for the redesign that is expected to be completed by this summer and barring any major delays reconstruction of the curve could be finished by summer of 2005. For more information contact Mark Pfeiffer at (502) 564-3419. The Northern Kentucky suburb of Burlington is applying for a state-controlled federal transportation grant to refurbish its sidewalks. Boone County Administrator Jim Parsons indicated that he believes the county's chances of being awarded the grant are improved this year now that Gov. Patton is no longer in office. Last year's grant money went to fund a study of Interstate 66 in Pike County, Gov. Patton's home county. State Representative Jodie Haydon, D-Bardstown, is attempting to develop a tourist railway between the Kentucky Railway Musuem in New Haven and Lebanon Junction off of I-65. Such a train faces a number of hurdles, including obtaining permission from CSX to use the line. This spring the northern end of the Pennyrile Parkway, which is also the US 41 Henderson Bypass, will be repaved at a cost $9.7 million. The Mercer County fiscal court will rename a section of US 68 in honor of the late Mercer County Judge-Executive Charles McGinnis who lost his battle with cancer in the fall. The Cumberland Gap Tunnel Authority in the process of installing new variable message signs along the approaches to the tunnel and inside the tunnel itself. This week work will be underway to install new signs in the tunnel itself. There will be temporary lane closures in both directions. Motorists are asked to obey speed limit signs and be mindful of tunnel employees. The Division of Driver Licensing will be located on the 2nd floor of the new Transportation Cabinet Office Building, which is located at 200 Mero Street, Frankfort, Kentucky 40622. The telephone number will remain the same, (502) 564-6800, however the individual extensions will change. The new extensions will be provided at a later date. "We�re very excited about the move into the new building,� Brunker added. �The new office building will greatly enhance the efficiency of the Division. With the new technology infrastructure in place, we will be able to provide the citizens of the Commonwealth with more efficient and timely service." The new 425,000 square foot Transportation Cabinet Office Building features state of the art design and technology feature which will enhance the performance of the Cabinet. The new building is structured along the "Open Space, Open Mind" concept, which is designed to improve communication and production. In addition, the building is equipped with an advanced technological infrastructure which will aid employees in fulfilling their duties for many years to come. Scott Burnside takes a look at why the hitchhiking is best considered a lost art in Kentucky New Era: Lost art of hitchhiking is best left lost (Jan. 26, 2004) . The University of Louisville will undertake a $150,000 of traffic conditions around their Belknap Campus. Of primary concern are a low underpass on Third Street, traffic on Eastern Parkway, and improving access to the campus from I-65. In a recent speech to the Owensboro Chamber Commerce, Gov. Ernie Fletcher reiterated a campaign process to remove tolls from the Natcher and Audubon Parkways. For the past six months, motorists have ignored road closed signs on Dorsey Lane near LaGrange Road in eastern Jefferson County only to find that the road is, in fact, closed. On June 30, 2003, CSX Transportation closed the railroad crossing on Dorsey Lane; however, traffic still continues to try to cross there. In the process of turning around, motorists are destroying local resident Jim Weinert's driveway. Weinert recently contacted CSX to see what could be done about the traffic situation. A rock fall blocked traffic on KY 3 in northern Lawrence County. Both lanes of traffic were closed while special equipment was used to break the boulder into smaller pieces for removal. Former Radcliff Mayor Jennings Smith died last Sunday while on vacation in Florida. Smith, who served from 1990 to 1998, was a major force behind the construction of KY 313 which connected the city to I-65. An Owensboro man was injured around 1:00am Tuesday, Jan. 20 when an alternator thrown from the Kentucky 279 overpass on the Audubon Parkway crashed through his window. The Kentucky State Police Henderson Post is investigating the incident. Anyone with information is asked to call (270) 685-3927 or (270) 826-3312. Leaders in Pikeville and Pike County are considering suing Quality Distribution over a chemical spill that closed US 23-the major corridor through the area-for an entire day in August. Pikeville and Pike County allege that Quality Distribution has failed to pay the amount that government agencies have requested for reimbursement. Due to construction along Cincinnati.s river front, the Roebling Suspension Bridge will be open only to south bound traffic through March. A detour for north bound travelers is marked. 12th street in Covington is still on schedule to be widened beginning in 2007; however, there has been little movement on efforts to rename the street in honor of Dr. Martin Luther King, Jr. The current six year highway plan calls for right-of-way acquisition for the widening project to begin next year. Local NAACP leaders have called for the street to be renamed; however, opposition of local residents continues to be a problem. A city backed survey last year found that residents along the street overwhelmingly opposed the renaming. The US 41A Fort Campbell Boulevard widening project reached a major milestone with the recent opening of six lanes of traffic and continuous left turn lane between within the city of Oak Grove. Construction along the highway is still ongoing. The Union County Highway Safety Task Force is planning several efforts to improve highway safety. Among the plans is a Health and Safety Fair to be held in May. Many in Union County remain concerned about the new Morganfield bypass; however, statistics are said to show that there is nothing wrong with the road: many of the accidents on the road are due to drive inattention. The bypass has rumble strips and intersections have stop signs twice the size of normal stop signs. Despite state budget problems, three road projects are still on track for construction this year. Paving and guardrail installation will be completed on about five miles of the US 231 reconstruction project in eastern Allen County, reconstruction of KY 101 between Chalybeate and US 31W will begin, and a bridge over Little Reedy Creek on KY 70 in Butler County will be replaced. Kentucky receives about $500 million in federal funds for road projects each year; however, the state must provide matching funds for 20% of construction costs. These funds have been drained in recent years. In addition to the two proposed new bridges in eastern Jefferson County, Louisville Metro Councilman Doug Hawkins is pushing for the construction of a bridge over the Ohio River in the western part of the county. The bridge would be two-lanes and would connect the Gene Snyder Freeway with either Cane Run Road or Indiana 111. The environment impact study for the two proposed interstate bridges included a southwest bridge option; however, it concluded that traffic usage would not be high. A southwestern bridge would likely carry 14,000 cars per day compared to 68,000 for the easternmost proposed interstate bridge. The Ohio Department of Transportation has once again this year announced that if temperatures drop below -5 degrees Fahrenheit, the Ironton-Russell Bridge will be closed until warmer weather returns. The Kentucky Transportation Cabinet Division of Planning has posted new information regarding a proposed new route connecting Harlan and Hazard. The material includes two maps of the area under consideration. A new I-65 interchange for the Kentucky Tri-Modal Transpark, an Outer Loop around Bowling Green, and construction of I-66 are among plans discussed by Bowling Green leaders following a Citizen.s Summit last November. Muhlenberg County Judge-Executive Rodney Kirtley met with state transportation officials this week and believes that work may soon start to replace the stretch of US 431 known as “Dead Man's Curve.” Design work will be carried out in the Madisonville office instead of Frankfort; this should decrease the amount of time required to complete the project. Three motorists have died in accidents at this curve since May. During the first week of 2004 General Assembly, several bills were offered to replace the “Mr. Smiley” license plate. Bills range from new plate proposals to offering decals to place over the smiley face. The Herald-Leader reporter points out that though many have obscured the smiley face on their own it is illegal to alter a license plate. 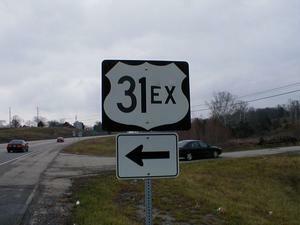 Mount Washington is home to a bit of signing oddity: instead of the old route of US 31E being marked "Business US 31E" it is marked as "US 31EX." Photos of this oddly signed route can be found here. The northeastern Jefferson County suburb of prospect will promote itself during a year-long .We Love Prospect. campaign. The city hopes to use its proximity to a proposed Ohio River bridge to attract new residents. State Senator Gary Tapp has proposed replacing the new smiling sun license plate with a plate of his own design. He has submitted a bill for consideration during the 2004 General Assembly. Tapp has a designed a replacement plate featuring the national and state flags along with the phrase "in God we trust." Plans to widen part of KY 16 in southern Kenton County are progressing. Work should begin with year with completion of the 4.2-mile project in 2009. Local residents have stepped up efforts to save a one-lane bridge over the mouth of the Little Sandy River. The bridge, built in 1884, was recently closed after it was deemed unsafe for traffic. The transportation cabinet plans to demolish the bridge and replace the span later in 2004. Transportation officials held a meeting in December to consider changing the approach to the Bob Cummings-Lincoln Trail Bridge in Hawesville. Any changes are not scheduled for construction in the current Six Year Plan; however, locals hope a lobbying campaign will move the project higher up the state.s list of priorities. Speed limits on I-471 have been raised from 55 MPH to 65 MPH. The move makes the highway.s speed limit consistent with the speed limit on I-275. This consistency is believed to make the road safer for travelers. The four-lane Natcher Bridge currently serves only 4,500 vehicles per day while the two-lane Grover Carey Bridge in Owensboro serves 10,000 vehicles per day and the two-lane Bob Cummings-Lincoln Trail Bridge at Hawesville serves 8,900 vehicles per day; however, transportation officials expect traffic on the bridge to increase once an extension of the Owensboro bypass is completed and US 231 is widened to four lanes in Indiana. Work to repaint the I-65 Kennedy Bridge over the Ohio River may soon resume. The transportation cabinet plans to let bids for the project this month. Work to repaint the bridge was stopped in October of 2001 after it was revealed that a transportation cabinet bridge inspector was soliciting bribes from contractors who were paining the bridge. Newly elected Governor Ernie Fletcher has appointed retired Air Force General Maxwell Clay Bailey as the new secretary of the Transportation Cabinet. Bailey, who currently lives in Paris, is a 1965 graduate of Paintsville High School and a 1969 graduate of the U.S. Air Force Academy. A report from a Transportation Cabinet inspector finds that a modification made to the route of the proposed southwest Somerset bypass was legitimate. Late in the planning, the route was shifted to the west where it would pass through land owned by brothers Doug and Guy Jones, both of whom were officials in the cabinet. The brothers later resigned. The report finds that the brothers resigned due to other reasons and that the change was a valid change. U.S. Representative Hal Rogers announced in December that a significant amount of transportation funding had been secured for Kentucky. Projects include $20 million for Kentucky's Appalachian Regional Corridor highways, $1.5 million for I-75 widening in Rockcastle County, $1 million for reconstruction of 7 miles of the Hal Rogers Parkway, and $8.5 million for I-66 in Pike County and Pulaski County. Work to construct a diamond interchange at 9th Street and Oak Street in Louisville has been completed. U.S. Representative Ann Northup secured $750,000 in federal funding for a Corps of Engineers study on converting the abandoned Big Four railroad bridge in downtown Louisville to a pedestrian walkway connecting Louisville and Jeffersonville, Indiana. Ground breaking for the last section of the US 119 widening project in Pike County was celebrated as .Paul Patton Day. on Nov. 22, 2003 to honor the former governor.s contributions to Eastern Kentucky highway projects. The Kentucky Transportation Cabinet Division of Planning is conducting a study concerning a new route connecting KY 33 north of Danville to US 150 east of Danville in Boyle County. Former Gov. Patton settled ethics charges by admitting to two of the four charges he faced from Executive Branch Ethics Committee. He agreed to pay a $5,000. He admitted to intervening in the approval of a company owned by his mistress Tina Conner as a disadvantaged business enterprise and to intervening in the promotion of a Kentucky Vehicle Enforcement officer who helped Conner out of a speeding ticket. The stretch of US 31W that passes the gold depository at Fort Knox will be repaved during a project scheduled to end by Dec. 1, 2004. Residents of Belton are asking state transportation officials to improve a section of US 431 known locally as "dead man's curve." Louisville, Kentucky (November 21, 2003)-The Kentucky Transportation Cabinet (KYTC) received a national award this week for an innovative safety project that has reduced the number of accidents at a busy Louisville intersection. The Brook and Jefferson Streets intersection in downtown Louisville, with 32,000 vehicles a day, was also a very frequent scene for accidents and near-accidents. The Auto Incident Recording System (AIRS), consisting of video cameras, microphones, computers and a video recording system, was installed in July, 2001. The data collected on AIRS showed that 50% of the crashes and 33% of the near crashes were associated with identical illegal left turns. Following the installation of additional signage and curb extensions, the crash number has been cut in half. James C. Codell, III, KYTC Secretary, received the award on Wednesday in Washington, DC from the Roadway Safety Foundation and the Federal Highway Administration. Kentucky was one of 13 projects selected from more than 130 entries as an initiative for saving lives by improving roadway design, operations and overall planning. The monitoring system is part of the Traffic Management System in the Greater Louisville Area (TRIMARC) project, which is managed by Northrop Grumman Mission Systems. The Louisville Metro Police and Public Works Department have been partners in the safety endeavor. In announcing the award, Secretary Codell said, �Safety is the number one priority for us at the Cabinet and we are honored to be recognized for improvements that have made conditions safer for motorists.� Codell explained that the use of state-of-the-art technology to make roadways safer is truly the wave of the future. Now that enhancements have been made at this key intersection, the equipment will be moved in the next few months to another high-incident location to collect similar data. The equipment is only used for improving safety and research purposes and not for enforcement. Louisville is the only US installation for this equipment, developed by Mitsubishi Electric Company of Japan.